With very few opportunities currently available to drill fresh onshore acreage in the US, there are, in turn, limited opportunities to find any significant catalysts in the US oil sector. Yet, Austin Exploration (ASX:AKK), an oil and gas company with a portfolio of US assets, has two imminent catalysts. Firstly, the company is just days away from the start of a high impact drilling campaign at its Columbus #1 well at its Pathfinder Project, which covers approximately 15,773 acres in one of America’s most prolific oil and gas basins, in a region known as the DJ Basin. Interestingly, the size of AKK’s land holding is big enough to build 400 wells at a scale that could be worth hundreds of millions of dollars in the future. Note this is a speculative value at this stage and should not be the sole focus of any investment decision related to this stock. If considering this stock for your portfolio, take into account your own personal circumstances and risk profile. Secondly, AKK will begin flow testing operations on its three wells when drilling of Columbus #1 is completed. This fully-funded three well drilling program has been conducted in a back-to-back manner as a batching style program for the cost effective price of just US$1.5M, meaning costs are low, but results across its three main wells could be high. An important part of AKK’s business model is to prove that its assets can be economic in a $40 a barrel oil price environment, so keeping costs low is a major priority. Meanwhile, highly accurate, high definition seismic already conducted across AKK’s first two wells has AKK hoping for further drilling success at Columbus #1. It is this first catalyst that we will concentrate on here. Phase 1 – Sequentially drilling the upper vertical sections on three wells. Phase 1 is complete. 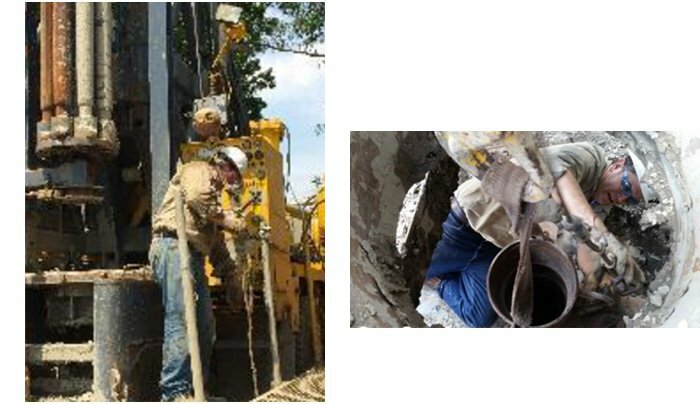 Phase 2 – Sequentially drilling the deviated well bore sections on the three wells. Phase 2 is underway. Phase 3 – Sequentially flow testing the three wells. Phase 3 is the next phase of the program and is yet to commence. What we are interested in here, however, is the high impact drilling that will take place next week at its third well, the Columbus #1 well. AKK has mobilised the Math Energy Drill Rig to the Columbus #1 Well site, along with the necessary equipment to begin immediate drilling. Drilling of the deviated portion of well bore, targeting production from the Pierre formation, will begin in the next few days. AKK has already been encouraged by the discovery of hydrocarbons in drilling at its first well – Magellan-1, which has already struck oil. 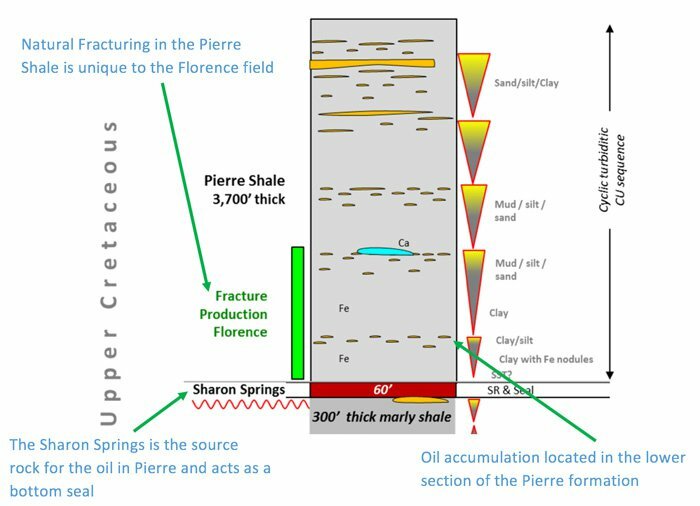 Having a well with a full column of oil indicates that the Pierre formation definitely has hydrocarbons present – now it’s a question of economics and production rates. Meanwhile AKK has also encountered several zones of intense natural fracturing in its second well, Marco Polo #1. All these milestones have been confirmed by an independent onsite geologist, but it is the imminent drilling of Columbus #1 that could push AKK even closer to production. We have briefly touched on its 15,773 acres in the prolific DJ Basin and one thing that has piqued the attention of investors, is AKK’s position. And the following map gives you an indication of exactly where AKK’s assets are in relation to the region as a whole. AKK’s untapped assets neighbour a project which has delivered 15.5 million barrels of oil in the past. 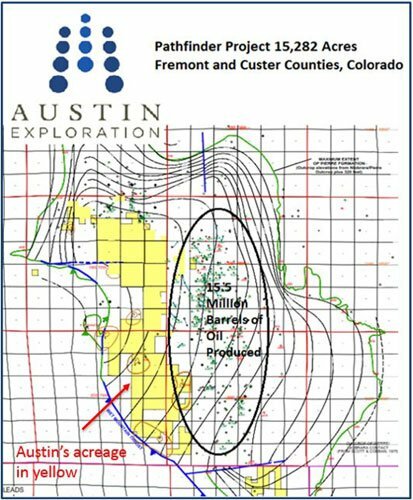 As further evidence of its strong position, Comet Ridge Energy (ASX:COI) drilled 22 wells to the east of Austin’s property from 2008 to 2012: daily production from these wells has reached an average 35,000 barrels of oil per well produced so far. Estimated recoverable reserves from this field have been put at 75,000 barrels per well. AKK’s 100% working interest in its Pathfinder Project could provide much greater scale due to the fact that the formation dips to the west creating a thicker pay zone in the Pierre formation. AKK’s acreage has previously been held for coal and gold mining which locked out the oil drillers, but AKK will be the first company in 150 years to have access to this property for drilling and has a historic opportunity to do what no other oiler in the history of the US has ever done. Will the numbers stack up? Keeping costs down is fundamental to AKK’s business model. By doing so it could capitalise on the current low price of oil and reap the rewards once the price inclines as it is expected to do. AKK has created a model that can be profitable at an oil price of just $40 a barrel. If you have a look at the graph below, it illustrates that AKK is well positioned to succeed in current market conditions. 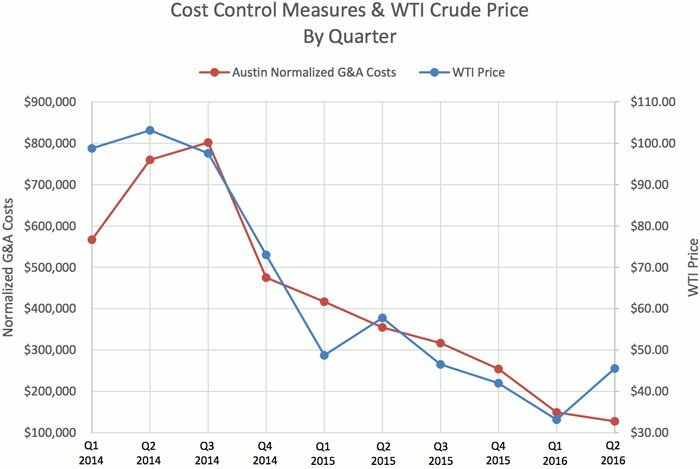 What the graph shows is that AKK’s cash rate is down below the rate of decline of the price of WTI (West Texas Intermediate – a grade of crude oil) meaning should WTI go back up (as many analysts are tipping), then AKK will be in a strong position to capture the widening gap between costs and WTI price. Most notably, salaries have been reduced from US$1.98M to US$500,000 per annum. That’s a significant saving. Should everything go to plan, AKK is bullish that it can generate $400 million over a decade. However, like all speculative oil companies, there is no guarantee the company will be able to generate this kind of cash flow, as it depends on a range of assumptions that may not eventuate – consult a professional financial advisor if considering an investment here. That figure assumes the number of producing wells at the project will reach over 120 over the 10 years. That’s 120 wells at the current oil price (steadily increasing over the period) and includes different flow rates on the wells. In the near term, AKK has set a figure of $10M by the end of 2017 based on 10 wells at 1000 BOPD and $45 a barrel. 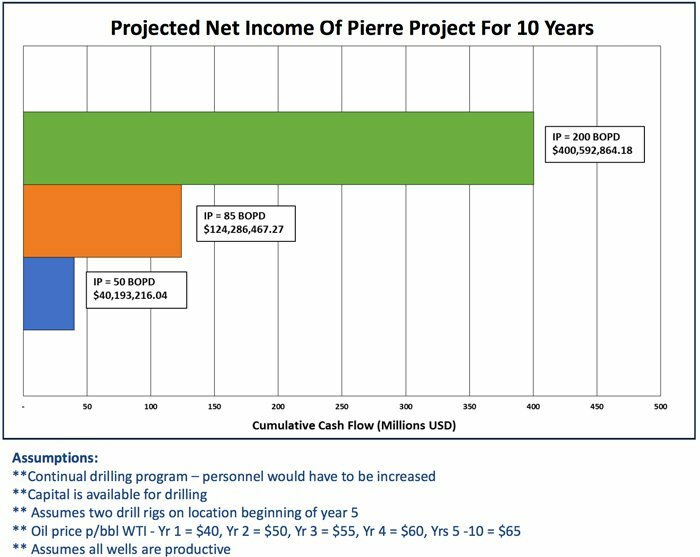 Here’s a look at AKK’s 10 year drilling plan. Now here is the projected net income. As you can see, AKK has done its sums and with drilling of its third well now imminent, it looks to be well on track to meeting its targets. With drilling at Columbus #1 to start in the coming days, AKK is just weeks away from its follow up catalyst: flow testing its three wells after completion of drilling at Columbus #1. Clearly there is potential for market moving news to be released in the near future. However this is speculative and success is no guarantee to come to fruition. If considering AKK for your portfolio, take a cautious approach and seek professional financial advice. AKK is hitting the right targets of its back-to-back drilling program. And its strategy in terms of undertaking a multi well program designed to significantly reduce drilling costs and maximise operational efficiencies, looks to be making an impact. AKK is now well progressed with its three-phase, three well program, and significant results are due over the coming days and weeks. The Company has scheduled flow testing of the three wells to commence upon drilling completion of the Columbus well. This could provide for further share price catalysts to emerge, following the coming drilling program.